Bingo Slot 25 Lines Slots has not been reviewed yet, be the first to rate this slot. 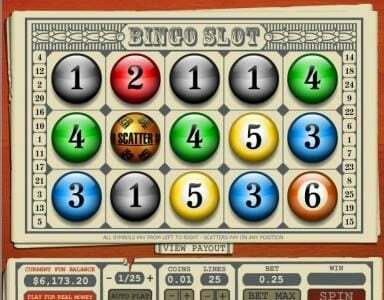 In Bingo Slot 25 Lines, the player has access to a game with 5 reels and 25 paylines. It was designed by Top Game, and it includes a jackpot of up to $1,800, while its features include Free Spins, scatter and wild symbols. The game of Bingo has many fans, all over the world, with UK being the place where the online version seems to have the most support. This slot uses the game of Bingo as its theme, and I expect that it will have quite a few fans. This is the version of the game with 25 paylines, but Top Game also created a 3 payline and a 5 payline version, which for the most part are identical with the one with 25 paylines. Since the theme is the game of Bingo, the slot’s reels are made to look just like a bingo card would. As for the symbols which were selected for it, they are Bingo balls, with numbers from 1 to 8 on them, plus symbols with balls which have the words Wild, Scatter or Bonus stamped on them. A maximum number of 25 coins on this slot can be played. The coin value is $0.01 at its lowest, with the highest possible value being $3. The resulting range for the bets placed by players is between $0.01 and $75. Considering the top jackpot of only $1,800, the maximum bet seems a bit high at first, but since there is a progressive jackpot as well in the game, things tend to even out. The wild symbol available in this slot is the purple ball, which has the word Wild written on it. It acts as a substitute whenever possible, creating winning combos. There are two symbols the Wild will not substitute though, and those are the other two special symbols. The same Wild symbol will give out the huge progressive jackpot, for which the player needs to use the maximum bet option and to get five wilds on the same payline. The second feature available here is the Scatter, represented by an orange ball. If there are at least three scatters on the reels, the player receives 5 spins or more, for free. The final feature of the game is its bonus round, activated by a minimum of three balls with the word Bonus on them. This should be a very interesting slot for anyone that enjoys Bingo as well. The progressive jackpot that this slot offers is another good reason to play the game.